One of Outsider reviewer L.K. 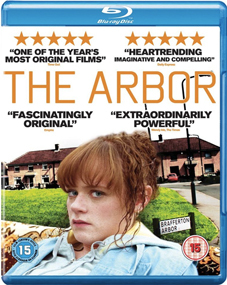 Weston's films of 2010, and with good reason, The Arbor tells the powerful true story of Bradford playwright Andrea Dunbar (The Arbor, Rita, Sue and Bob Too) and her daughter Lorraine. Dunbar wrote honestly and unflinchingly about her upbringing on the Buttershaw Estate and was hailed as 'a genius straight from the slums' by playwright Shelagh Delaney. Her first play, The Arbor, originally written as part of a school assignment, described the experiences of a pregnant teenager with an abusive drunken father. Its success at The Royal Court Theatre led to Dunbar's commission to write Rita Sue and Bob Too in 1982. The play and subsequent film by Alan Clark, was described as a portrait of 'Thatcher's Britain with its knickers down.' The film garnered critical acclaim at the Cannes, Berlin and Edinburgh Film Festivals in 1987 and is now considered a cult classic. The film was directed by artist and filmmaker Clio Barnard, who also grew up in the Bradford region and in making the film wanted to revisit the Buttershaw estate to see how it had changed in the two decades since Dunbar's death. Barnard, who won the The Best New Documentary Film Maker award at the Tribecca Film Festival earlier this year, recorded audio interviews with Lorraine Dunbar, other members of the Dunbar family and residents from the Buttershaw Estate over a period of two years. These interviews were edited to form an audio 'screenplay,' which forms the basis of the film as actors lip-synch to the voices of the interviewees. This footage was intercut with extensive archive clips as well as extracts from Andrea's first stage play, The Arbor, filmed as a live outdoor performance on the Buttershaw Estate, to an audience of its residents.